Having problems With Your Refrigerator or Freezer? ​We would be happy to help! Valley View Appliances offers trustworthy service for your refrigerator or freezer repair and we strive to make your experience successful from start to finish. As a leader in the industry, Valley View Appliances will be able to provide you with top-notch service and we will get your refrigerator or freezer repaired smoothly and efficiently. 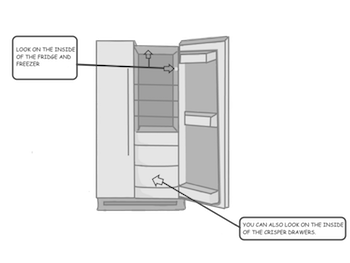 Referring to the image, locate and then record the model and serial number of your fridge or freezer. Keep it handy as we will need it when you book the service call. Ensure that the power is on. If the lights come on when the fridge or freezer door is opened, this would indicate that you have power to the appliance. Make sure the fridge or freezer door hasn't been left ajar by looking at the door gasket when the door is closed to ensure a tight fit. Due to the complexity of fridges and freezers, any repairs are best left to our certified appliance technicians. We would be happy to help you with your fridge or freezer repair service. Did you know that by applying the following tips, you can keep your fridge or freezer running more smoothly and efficiently. Ensure proper airflow by vacuuming the condenser coils regularly (refer to your owner's manual for location). Ensure your door gaskets are in good shape and sealing properly to aid in proper cooling. For stainless steel finishes, use the recommended professional cleaners and soft cloths to prevent scratching. These cleaners can be ordered directly from our part's line at 1-866-243-4662 and we also carry a wide variety of recommended cleaners in our service vehicles. Ensure you're changing your water filters when recommended. Not all water filters are created equal. By using manufacturer's specific parts, you will guarantee the best water quality. Due to the complexity of working with fridges or freezers, any repairs are best left to our certified appliance technicians. 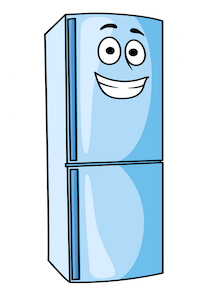 We would be happy to help you with your fridge or freezer repair service. To order refrigerator or freezer cleaners, water or air filters, or other supplies call 1-866-243-4662.